"HOW DO YOU SPELL 'SEDDON'?" Unsteady flow in open channels is a fascinating subject, but one that, in my experience, has yet to reach most engineers in practice. In the Spring of 1987, I was invited to give a lecture at the U.S. Army Corps of Engineers' Hydrologic Engineering Center, in Davis, California. The meeting was attended by approximately forty army engineers from various parts of the United States. The topic of my presentation was "Unsteady flow in open channels." I spoke about kinematic, diffusion and dynamic waves. I compared Manning's flow velocity with Seddon's kinematic wave celerity, and described the exponent of the rating, which characterizes Seddon's celerity, i.e., the velocity of flood waves. Indeed, as early as 1900, Seddon, working the Lower Mississippi river, had experimentally laid the foundations of flood routing, one of the subjects in unsteady flow in open channels. At the end of the lecture, one of the more senior participants, obviously an experienced hydraulic engineer, asked a question: "How do you spell 'Seddon'? I have never heard about him before." 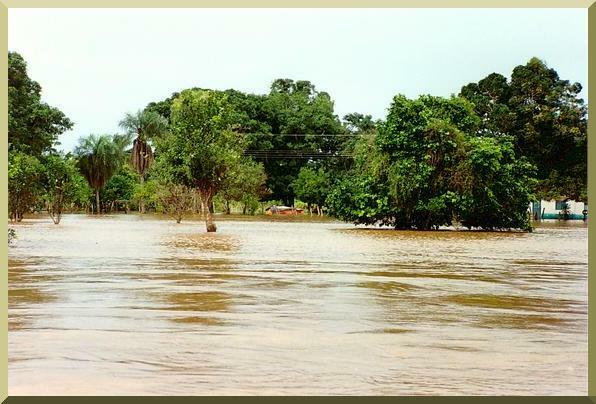 Flood stage on the Cuiaba river, Mato Grosso, Brazil, on January 10, 1995.